Live webcasting is fantastic technology – the ability to see and hear events in faraway places – no matter where we are – is incredible. However, it doesn’t really work for professional, presentation led events – something is always missing. The problem is that when we’re at any presentation based event – for example, a conference or seminar, we’re interacting with the presenter on multiple levels – asking questions, partaking in polls, even expressing a mood or vibe in the room. Watching a webcast of the same event, we get none of that – we just watch. Getting up and presenting to an audience is a vital communication tool for any organisation, and it’s the core product for some. The biggest headache by far is getting the audience in the room; they can be spread far and wide – anything from around a region to globally, and getting them in one place is like herding cats. Creating webcast versions of events seems to be the logical answer and would get around this problem. If the online experience was as good as being there, it would be a no-brainer – for either producers or viewers – but that’s not the case. 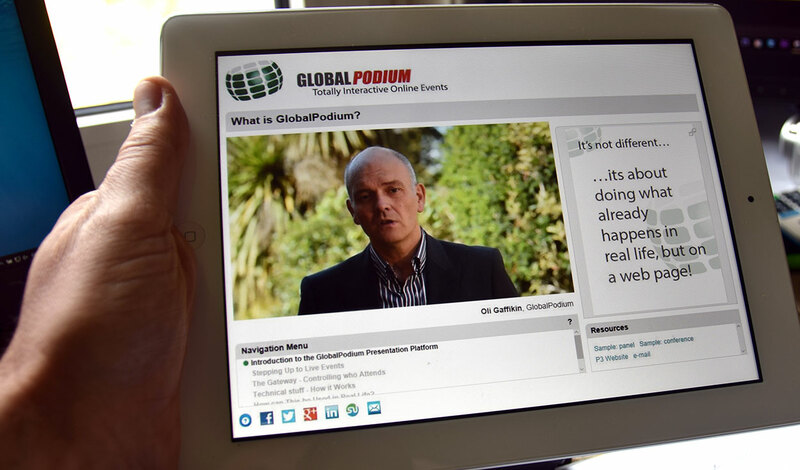 At GlobalPodium, we created our own presentation webcast platform – largely because there was no 3rd party product that did what our clients were asking for. We’re having great success in the toughest arena – live webcasting Continuing Professional Development seminars, where highly intelligent (often Ph.D. level) viewers are paying top rates for access to live online content, and failure at any stage has real financial consequences. We’re often asked about the key factors in creating successful presentation webcasts, so I thought I’d write this article outlining the three essentials you need to know if taking something like this on. The first and most important question to ask is what do we want to deliver to viewers – a video of proceedings, or an experience similar to being there? A video of events simply doesn’t cut it. The audience in the room are involved on multiple levels, and the same has to be true for the online audience; if it isn’t, they’ll feel less involved, and that they’re getting a poor substitute for being there. They need to feel that not being in the room isn’t a big deal! To do this, we need much more than just a video and slides – we need a visual, interactive experience – just like being there. A presentation isn’t a performance by the presenter; it’s more of a conversation the presenter is leading. Creating this experience for online viewers is the objective then – if we can achieve that, then we can market events to the world, not just those who can make it to the room. This sounds obvious – but it has to just work; easily, first time, and for everyone, everywhere. Your audience may be on any number of devices – smartphone, tablet, laptop or desktop, on a great array of operating systems – Windows, Mac, Android, Apple iOS, and others (we even get viewers trying to watch via PlayStation or Xbox! ), and it’s vital that your delivery platform works easily and reliably across all of these, and there is only one way to do that – by making events work in a standard web page. This way your event will show seamlessly across all devices, the page can be responsive, so it will align differently – a smartphone will lay out differently to a laptop. This also raises the question of how much technical knowledge do you assume for your audience? Easy – almost none! The most you can ask of them is to click on a link in an email and enter their name when prompted. Anything more will cause a world of problems; if you ask them to install a plugin or program on their device, a large number will disappear; they may not want or be able to comply for a variety of reasons. A single click is all you get. Branding guidelines exist for a reason, and making content consistent and professional is important – actually, it’s the bare minimum. User interfaces are becoming ever more sophisticated – so this is now expected, and a poor look is counterproductive. Making video content look the part is difficult – every situation is different, some presenters walk around, some don’t, some rooms are well lit, most aren’t, and even the weather affects light levels in a room, all of which contribute to our video picture. The problem is every time we turn on the TV we see hugely expensive and highly professional video productions that we accept as the norm – the bar is set unrealistically high. When we produce a video on a more modest budget, it can look cheap and be counterproductive if we’re not careful; it’s essential video and audio is created with professionalism and care, otherwise, it will detract from the message. We’re not making a movie, it doesn’t need to be a huge production, but it does need to be good. A decent camera with an experienced operator is highly desirable. If you do it yourself, it will look like you did it yourself – think about that! At GlobalPodium we create interactive webcasts, both live and recorded, for a variety of clients, and these are the three pillars of our offering. It may be a panel discussion, CPD seminar, conference, research presentation, a book launch, AGM, or any presentation driven event, the objectives are the same – to make the online audience feel as much part of things as the audience in the room. It’s not an easy task, but we think we’ve cracked it – supported by the fact that most of our CPD clients now charge more to attend seminars online than to attend in person. This is totally contrary to the trend, where online access is always the poor cousin of being there in person; the experience must be good for this to have happened.